Regardless of your airline or itinerary, you will need to go through airport security before you can go to your departure gate. Our tips will help you get ready for the airport security screening process. Wear clothing and shoes without metallic embellishment. Be ready to remove your belt if it has a metal buckle. Tuck large metal jewelry pieces into your carry-on bag before you go through the security checkpoint. Put change and keys into your carry-on or empty your pockets into a plastic bin when you arrive at the checkpoint. If you have body piercings, either remove them before you go through security or resign yourself to a pat-down screening. You will have to take your shoes off at the security checkpoint and put them into a plastic bin for screening unless you are over age 75. Several thousand humans walk through the metal detectors each day, so you will probably want to protect yourself from germs by wearing socks. Take your time removing and putting on shoes; if you rush to complete this process, you are more likely to leave belongings behind. All liquid and gel items must be in 100 milliliter (3.4 ounces) or smaller containers. Every liquid and gel product you carry into the passenger compartment must meet this requirement and fit into a single, one-quart zip-closure clear plastic bag. If you must bring larger liquid or gel items, you will have to place them in your checked baggage unless they are medically necessary (see below). Gel-like food items such as peanut butter, jello and pumpkin pie will be confiscated, so it is best to leave them at home. Natural powders may need extra screening. Consider putting powders into your checked bag unless they are medically necessary. You can bring prescription liquid medications through security. You can also bring medically-necessary water, juice and other "liquid nutrition" as well as frozen liquids or gels that you will use to cool medical items. Prosthetics and medical items are also permitted. The catch? Everything must be screened in some way. Tell the security screeners what medical and disability-related items you have with you and ask them to screen the items visually if X-rays will harm them. (Important: Never put prescription medications in checked baggage. Not all airports have TSA PreCheck lanes open all the time, and not all areas of every airport have PreCheck lanes available. For example, C Pier at Baltimore / Washington Thurgood Marshall International Airport does not have a PreCheck lane, and PreCheck lanes at the other three piers are not always open. Even if your ticket is marked "TSA PRE," you may not be able to find an open PreCheck lane. Always be ready to go through the regular security screening process. You will be asked to take your laptop out of its case unless it is in a TSA-approved laptop case or you have TSA PreCheck. Pack your camera carefully. If you are carrying undeveloped film, ask your screener to inspect it by hand. X-ray screening will damage undeveloped film, but it will not affect a digital camera's memory card. You will need to take off your coat or jacket and place it in a plastic bin at the security screening checkpoint. You will also need to remove your shoes and place them, carry-on items and metal items in bins for X-ray screening. Travelers age 75 and older may keep shoes and light jackets on. Give yourself plenty of time to regroup after the screening process is complete. You can keep your head covered during the screening process. However, if your head covering is too concealing, you will be asked to undergo a pat-down screening, which may or may not involve removal of your head covering. You may ask the screening official to conduct the pat-down and / or head covering removal in a screening area away from public view. Be prepared to show screening officials your identification, whether it be driver's license or passport, and your boarding pass at any time. You will need to take your pet out of its carrier, put the carrier through X-ray screening and hand-carry your pet through the metal detector. If you're bringing Fido or Fluffy onto your airplane, leave your expensive designer silk shirts at home, just in case the security screening process becomes stressful for your pet. Buying two bottles of rum at the duty-free shop may save you money, but may not save you time if you have to change planes after clearing customs. You will need to put those two bottles into a checked bag, as liquids in containers larger than 100 milliliters (3.4 ounces) cannot be carried into the passenger compartment of your aircraft unless you need them for medical or baby feeding purposes. If you forget to empty your pockets, you will have to step back, empty them, place the items on the scanner belt and then go through the scanner again. You may also have to be screened by wand or pat-down. Emptying your pockets before you head to the airport will speed up the screening process. If your carefully-chosen belt has too much metal on it, you may be asked to remove it and put it on the scanner belt. Regardless of the hectic atmosphere at the security screening point, take your time and ask all the questions you wish. If you rush through the screening process, you may forget to take one of your personal items with you. Even worse, you could be a theft target, as pickpockets are known to frequent airport security screening areas. Pay attention to your surroundings and keep a hand on your purse or laptop case as you put your shoes and coat back on. The airport security screening process, while annoying and time-consuming, does serve a purpose. TSA officials have confiscated guns, bullets, knives, hand grenades and other items from travelers. Planning ahead for your security screening will help minimize problems and speed up the screening process. 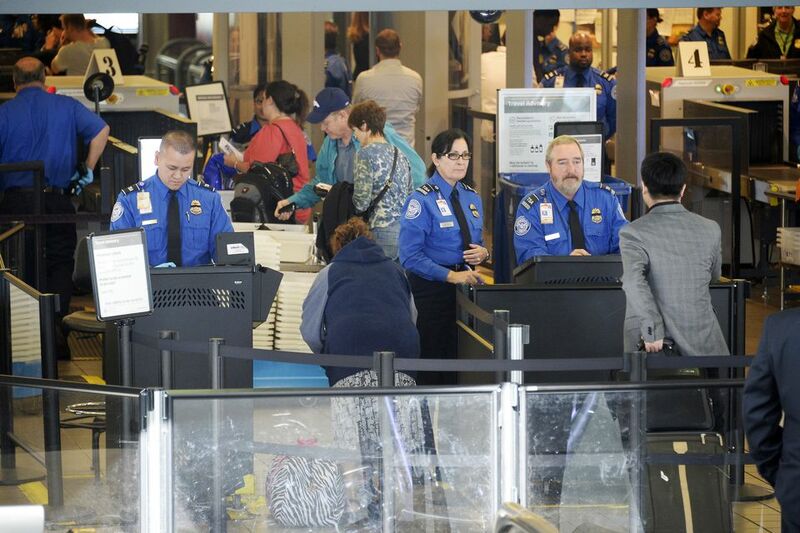 These 8 tips will help you fly through TSA airport security checkpoints.